THANK YOU RALLY THIS THURSDAY! Come celebrate OBT reaching its fundraising goal by joining OBT dancers and staff to raise awareness and support for the broader Portland arts community. It's all happening Thursday July 2nd! We’ll assemble just before noon to thank Portland for making Dance United such a rousing success and to voice our support for the other fabulous and derserving artists in our city. Make a sign telling people which local arts organizations you support and help us distribute flyers for the Regional Arts and Culture Council. Details will be announced shortly. Check here for updates. Still no time to rest on our laurels-- there's a big season ahead that needs to be funded-- but the atmosphere around the OBT building today was markedly calmer and more relaxed, as if we all could take a deep breath again. It can't be said enough times how remarkable the past few weeks have been, in so many ways. We are now, most certainly, regrouped, reawakened, and poised as an organization to take on the future, to show the people of Portland that not only are we eternally grateful to them, but we will continue to give back in the form of art, beauty, culture, and education. It also cannot be said enough times, so here is one more hearfelt and enormous THANK YOU!!! 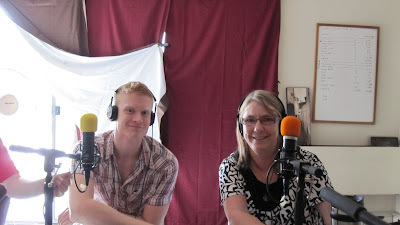 This afternoon principal dancer Gavin Larsen, stage manager Ashby, wardrobe manager Kathy Scoggins, dance historian Linda Besant, and myself went to be featured on Small Plates Radio Network with Sabrina Miller. We talked of Dance United from the points of view of a dancer, an audience member, as well as a member of the crew. 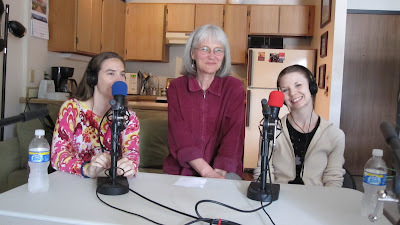 Visit the website to hear this week's cast as well as last weeks. And tune in next week for the final installment of OBT Radio. And it was spectacular. I think this photo says it all. The joy, energy, enthusiasm, and support that we felt from both sides of the curtain on Friday night was unprecedented. After about a week of rest I am still struggling to find words to describe the enormity of the event on Friday. I think the feeling of humility has been overwhelming for me. The generosity of every dancer that was a part of Dance United astounds and blesses me. I was so grateful to hear that when people were asked to participate in this that they didn't have any reservations about it. Christiana Bennett, principal dancer of Ballet West told me, "This is terrible, what's happening to you. This city can't lose OBT. This country can't lose OBT. This is an arts organization that needs to be around." I think I also was hit by the fact that though I don't know any of these dancers personally, that it was still a family. The international dance community rallied around us in our time of need, and it will not be forgotten. The dancing was terrific. Dancers that I've only heard of, or read their reviews in Dance Magazine, were sharing a stage with OBT. The overall goal of the evening was the benefit, but as the evening continued, I just saw it as a showcase for some of the best dancing that's happening in the country right now. A friend of mine that attended the show simply thanked me after the show. "Thank you for dancing in Portland," she said. And that was one of the biggest complements that I've received. Often when I tell people, in this city or elsewhere, that I dance for a ballet company in Portland, Oregon, they ask why I don't move to LA or New York. Dance United, and the community outpouring last weekend, solidified for me that great dancing is happening here in Portland. I hope you continue to dance with us. I think we of OBT rested for about 24 hours, at most, after the amazing events of Friday night before hitting the ground running again. Dance United was, as had been predicted and promoted, an unprecedented dance event in the city of Portland. Judging from the responses from the people of this city and the dancers of this country, it may have been the first but may not be the last time such a beautiful celebration of dance takes place in Portland. It was easy for me, as a performer that night, to forget about the real reason why we were dancing. Surrounded by previously unknown colleauges (all dancers have an invisible bond that stretches across time and distance), all of us concerned with our reason for being--- performing--- it seemed only natural that we were together, putting on a show. That's what we do. The fact that it was a performance put together in a flash, bringing together dancers whose paths may never have crossed otherwise and putting new choreography and dance styles together on the Keller stage seemed secondary to the bottom line. At the end of the night, it was a house packed to the rafters with people screaming for the love of what they had just seen, and wanting more. It didn't seem to be about the money, it was about the art. So, a great success and an unforgettable experience for all of us involved, but we're not in the clear yet. Our beyond-dedicated administration and staff are still working feverishly (though hopefully not 24-hour shifts anymore). We all are. There have been so many touching stories over the past few weeks. Mia's grandmother parcelling out her donations to OBT every week because she can't afford to give a lump sum. The wait staff from Carafe donating their tips to OBT after the show on Friday night. Our stage crew making personal donations to help us stay afloat. These stories are humbling, but also energizing and inspiring. We have to succeed, so those who have shown their support of us will not be let down! As many times as I've watch this ballet, I never stop laughing my head off at the characters that emerge from my fellow dancers. We're all hams at heart, which is why we love to perform, and a ballet like this gives the dancers a rare opportunity to really play to the audience in a totally different way. Sunday matinee feels like a very long time ago already. We took a couple of days off and then hit the studio again to prepare for the big events of tomorrow. It's going to be a very exciting, jam-packed day of high octane dancing and emotional resonance. I've spoken with many people in the Portland community who expressed their support and admiration for what we are doing. Hearing that gives me a wonderful sense that this city will not let their company go away. I think we'll get an outpouring of enthusiasm tomorrow night from our amazing, loyal, passionate fans in the audience of Dance United! There's good progress... that picture of dancing guy that's keeping track of incoming funds is red up to his knee! Let's put him in full red tights by the end of the weekend, ok? Ansa Deguchi and Leta Biasucci listen to notes before a run-through of The Cage. It is always a beehive of activity at the OBT studios when we are about to open a show, but the level of energy and activity over here right now is off the charts. The devo, marketing and administrative staff are madly orchestrating this massive fundraising effort we're undertaking. The atmosphere back there in the offices is intense and focused. The latest news and numbers are filtered throughout the building as they come in, and we all cheer when we hear of another generous donation or positive sign. In the studio, it's equally intense. It's an absolute blessing to be able to focus on something else--- not money, not deficits or bills or deadlines--- and just do what we can do best, what we are here to do and what will (we hope) see us through this crisis. It's a beautiful thing, to be able to escape the world's problems (even when those problems are threatening to bang down the door), go into the studio, and work. What is different now is the inescapable recognition of the importance of our work in the studio and onstage. While it is in the nature of every dancer to never settle for less than perfection (which is why we never stop working), right now there is a sense of higher stakes. When we are asking the people of our city to consider what the loss of their ballet company would mean to them, we need to be sure to prove that they do need us. We cannot afford to be anything less than stellar and heartstopping when we perform this weekend. And I think our audiences will agree with me, after they see these performances, that they have just witnessed a theatrical experience of intense passion and beauty, beyond what could have been imagined.